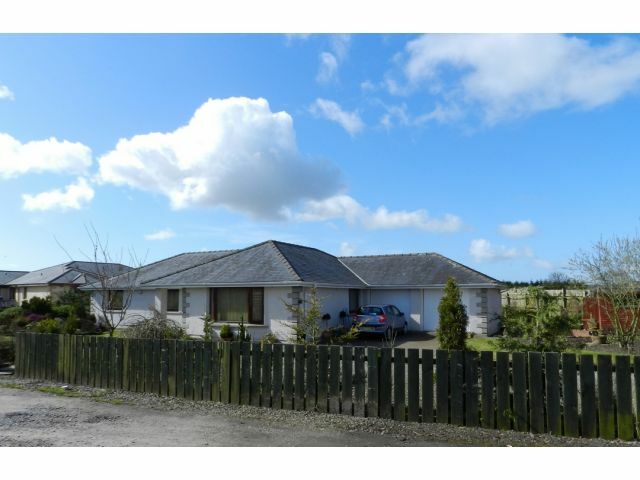 Rumbalara enjoys a peaceful location in the village of Eaglesfield which has it's own Primary School, Post Office and easy access to the M74 for commuting North & South. This modern bungalow has excellent family living space compromising of a generous Lounge with Dining Area and an open plan Dining Kitchen with Doors leading out to the rear garden and a separate Utility Room. There are Four well proportioned Bedrooms (all with built in wardrobes) and the Master benefits from an En Suite Shower Room. Outside there are extensive gardens surrounding the property made up of lawn, low maintenance sections and a generous amount of parking with access to the double integral garage. Call us on 01461 205690 to arrange a day & time that's suitable to you! Window to front. Coving, recessed lighting, telephone point. Oak effect flooring. Loft access (with light). Coving, recessed lighting, smoke alarm. Storage cupboard. Oak effect flooring. Windows to front and side with curtain poles and blinds. Coving, two ceiling lights and TV point. Wall mounted electric living flame fire. Carpeted flooring. Window to rear with blinds. Coving, recessed lighting. Range of newly fitted Shaker style wall and base cabinets with oak work surfaces and island with granite worktop with base units, shelves and two down lights. Electric Rangemaster stove and extractor fan. 1 & ½ ceramic sink with mixer tap, integral dishwasher. Space for dining table and chairs and family area. Vinyl flooring. Patio doors with blinds to rear garden and door to integral garage. Window to side with blinds. Coving, ceiling light, extractor fan. Storage cupboard. Wall and base units, stainless steel sink and drainer. Plumbing for washing machine and tumble drier. Space for fridge freezer. Pulley clothes airer. Tiled flooring. Door to rear garden. Window to front with curtain pole and blinds. Coving, ceiling light, two recessed lights, TV point. Triple built in wardrobes. Carpeted flooring. Window to side with blinds. Recessed lighting, extractor fan. Toilet, wash hand basin, shaving point, shower cubicle with mains fed shower. Tiled walls. Tiled flooring. Window to front with blinds. Coving, ceiling light, recessed light, telephone point, TV point. Double built in wardrobes. Carpeted flooring. Window to rear with blinds. Coving, recessed light, ceiling light, TV point. Double built in wardrobes. Laminated flooring. Window to rear with blinds. Coving, ceiling light, recessed light, TV point. Double built in wardrobes. Carpeted flooring. Window to rear with blinds. Coving, recessed lighting, extractor fan. Suite comprising of toilet, wash hand basin set into vanity unit, bath and shower cubicle with mains fed shower. Tiled walls. Electric towel rail. Tiled flooring. Ample off road parking for several vehicles and integral double garage. Front garden comprises of lawn and rockery. Garden shed, greenhouse and chipped area with shrubbery to the side and enclosed rear garden with lawn, shrubbery, rockery and a rotary clothes drier and garden pond. Open outlook at rear. Outside lighting and outside tap. Underfloor heating throughout with independent room temperature controls. Mains water, electricity, oil central heating and mains drainage. Offers of £270,000 are invited and should be submitted to lj Residential, 93 High Street, Annan, DG12 6DJ or by fax to: 01461 205037. Newly decorated and carpeted throughout!